The yellow room at the Viceroy Santa Monica provides interesting mid-century-modern decor, but it requires use of off-camera lighting to truly capture the room's brilliant yellow color. Without off-camera lighting the yellow of the room's decor shines directly onto a subject's skin, thus turning them yellow. 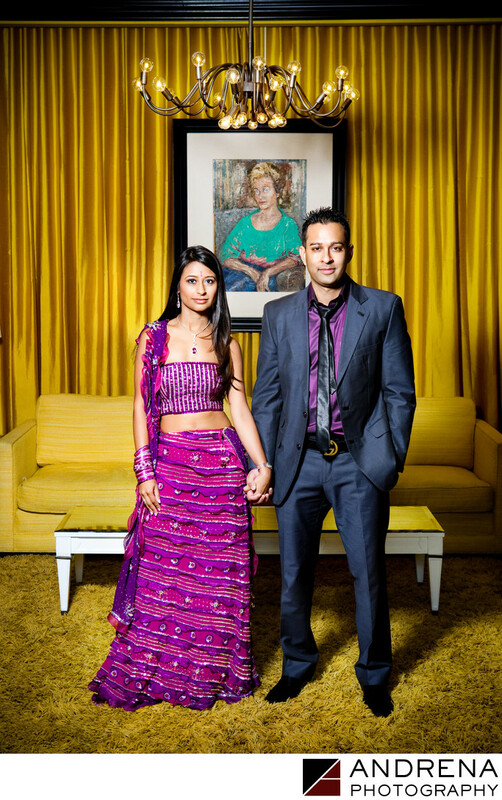 This photo of Cinal Bhindi and Taju Patel was shot with a single strobe and a small softbox. I love how the coordinated purple in their outfits plays against the yellow of the room. Engagement session photographed at the Viceroy Santa Monica in California.